Delphia Escape 1080 S, "Sunny" is the latest model produced by Delphia Yachts, enlarging the range of motor yachts called "Delphia Escape". 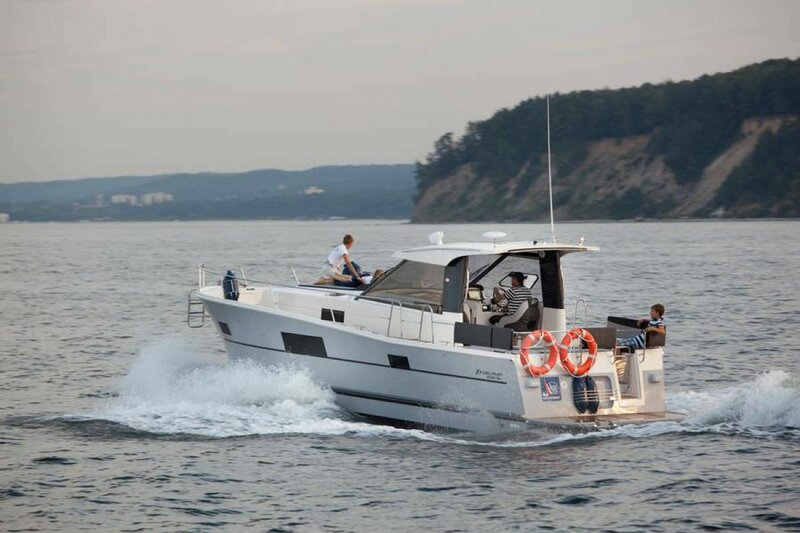 With its innovative and modern contemporary design, easily driven hull giving excellent fuel economy, this is an ideal family boat, or for the fishermen, and perhaps a couple who wish to coastal cruise. The 1080 was derived as a result of a survey with the public and dealers at a major European Boat show, asking for suggestions on how they would like the boat to be. After much deliberation on all the suggestions, the 1080 came to be. This boat is available in 2 versions of interior layouts, the standard 2 cabin interior, with 2 double private cabins, a spacious saloon and galley, or a 3 cabin, with 3 double sleeping cabins. This motor yacht is designed for offshore coastal cruising with a large range of engine sizes available up to a maximum of 180HP. Standard hull colour is white, with dark blue waterline stripes, but Burgundy, dark blue and graphite are additional cost options. An optional retractable sunshade is shown in the photos coming out over the cockpit seating area. Hot and cold water is standard, as is a bow thruster making docking or maneuvering in tight quarters a breeze. This boat is perfect for private owners who enjoy comfort and safety and the independence of choosing their own cruising grounds, and would also be a very good choice for charter operators with its extremely economical operating costs. With the tank capacities of 300 litres fuel and 300 litres water, the available cruising range and time spent out on the water can be increased---more relaxation and fun in the sun. The 115HP 3.8 litre Kubota based Nanni is suggested, as having ample power and low rev torque in a low revving engine, and fuel consumption at 2000rpm is quoted by Nanni as being 10 litres per hour. Very easy on the bank balance. Other available engines include, 50HP Nanni, 75HP Volvo, 85HP Nanni, 165HP Nanni, and 180HP Nanni. 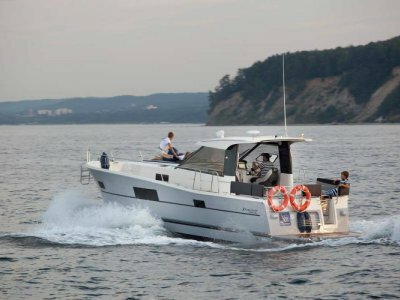 Engine choice could be varied with your area of operation, harbour cruising could find a smaller engine suitable, but for open ocean the 115HP or larger could be more suitable. Engine room: Well insulated engine room with removable panels for routine engine servicing. 3.8kw diesel powered genset an available option. 300 litres water plus hws. 2 burner cooktop, excellent storage in the lockers and shelves, cover over sink increases working counter space, single lever tap at sink, with hot and cold water. Waste basket, rectangular table with sofa and bench. Cream coloured upholstery with white imitation leather on boards. 75 litre top opening fridge. This is the most efficient configuration, but front opening fridges available. Double private cabin forward with double bed and hanging locker, shelves and seat. . Spacious comfortable saloon with galley and dining area, double aft cabin, or two double aft cabins in the optional 3 cabin version. Led lighting throughout, with the warmth of light mahogany timber finishes. Optional at additional cost timber finishes available in Cherry, walnut, or beech. Helm position with comfortable seat and instrument console. Seating with storage lockers aft in the cockpit with access to boarding platform through lifeline gates. Yes, hot and cold, plus deck shower. Quick electric anchor winch, 10KG Delta anchor with 50m x 8mm galvanised chain. Horn, 12v electric and manual bilge pumps, fire extinguisher, state transport safeties added at time of delivery, epirb, life jackets, flares etc. Airconditioning is available as an option. 40 amp battery charger, Fusion stereo with am/fm, vhf, Ipod, antenna and 2 speakers in cabin. Optional cockpit speakers available. Compass, Lowrance Link 5 VHF transmitter with DSC, and antenna. Lowrance HDS 12 GPS/Chartplotter/fishfinder depth sounder. Pricing correct as of March 2014. Variations will occur with currency exchange fluctuations.